Like bacon going with everything, there are people out there who believe that grilling is the answer to all food preparation. While the Accidental Locavore loves not having to scrub pans, some things (like the grilled Caesar salad) are surprisingly tasty, some are not really worth grilling, and others are just fun to toss on if you’ve got a fire going. In honor of Labor Day, I decided to grill a couple of things I was curious about, lemons for a vinaigrette, and avocados. The lemon idea came from a recipe I’d seen for a caramelized tangerine vinaigrette. I’ve grilled limes before to go with lamb and they were so good! So the idea of grilling lemons and using them in vinaigrette seemed like a no-brainer. The only issue? It was already looking like a late lunch and I was hungry. 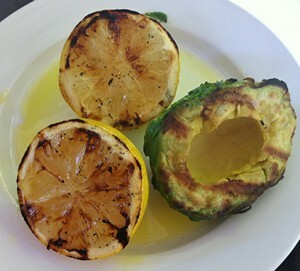 However, in the interest of research, the grill was lit and the lemon was dipped in olive oil and grilled. I might have been too hungry (i.e. impatient) to let them grill long enough, but when squeezed into the salad, there was not a noticeable difference. The idea for grilling avocados came from a photo on Pinterest a few months ago. For some reason, the grill and the avocados never really came together before today. But, there they were, so the avocado got peeled, dipped in the olive oil and grilled, cut-side down, for about three minutes. Unlike the lemons, the flavor of the avocado seemed improved by grilling. Whether the flavor was enhanced by grilling, or because the heat had warmed it up, it was wonderfully rich and tasty. My verdict: If you’ve got a grill going, by all means, cut avocados in half, dip them in some olive oil and grill them. Same for any citrus fruit. Try it and let me know what you think.